This is the best preserved Thracian sanctuary and the only Nymphaeum in Bulgaria. In 1968 it was declared a National Cultural Site. The Nymph sanctuary is situated in a picturesque area at about a kilometer and a half to the South-East of Kasnakovo village, lying on the border between Haskovo and Dimitrovgrad Municipalities. In the 2nd century the Roman citizen of Thracian origin Titus Flavius Esbenerius was awarded for his loyal 30-year service to Rome with a piece of land thereabouts. 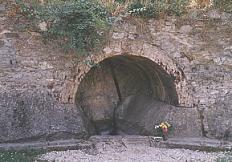 The veteran of the Roman Army and his wife erected a sanctuary in honour of the nymphs of Aphrodite. Apart from the three springs of curing water, the site includes a big amphitheatre, shrine and worshippers premises. During the times of Christening a chapel was erected there on the name of St. Spas, but nothing has been preserved of it. Every year the local village people organize fairs in honour of the Saint, leaving there gifts, burning candles and offering sacrifice near the springs. They say the water cures different diseases.